I moved your post to the proper location since it's about installing Anti-Ransomware. 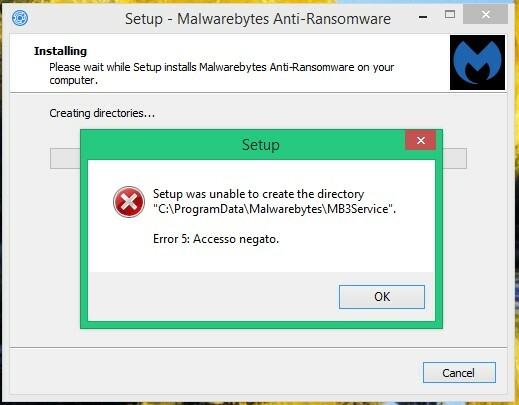 Do you have regular Malwarebytes 3 installed when you are trying to install Anti-Ransomware? I have another problem about the previous & latest version of Malwarebytes Anti-Ransomware beta. It is shown in the attached image. It seems that the program is not able to create a directory in Program Data folder. Then, after I clicked OK, it tells me that I shoud repair the problem LOL . How may I ever be able to correct such a problem..? Are you able to help me, please..? Hi @akirod - In your previous topic, Devin had asked if you were also running Malwarebytes Premium. Is this the case? Are you trying to install from a standard user account, or an admin account? I'd like to collect some diagnostic logs for review. Thanks for your answer & support. I have the Premium version of Malwarebytes 2.2.1. in this Lenovo G-510 under Windows 8.1, and I tried even to open Malwarebytes Anti-Ransomware as Administrator but the result is the same you saw in my attached image. I followed your suggestions and the two files .txt are attached to this my answer. I hope that they may help to find out a solution. Hi Akirod. Are you aware that our Malwarebytes 3 Premium includes Anti-Ransomware protection? It also includes Anti-Exploit protection. You are entitled to upgrade to the latest version of Malwarebytes 3. From looking at your logs, it maybe an issue of conflict with either Avast or Advanced SystemCare. If you prefer to continue to try to install the standalone Beta rather than upgrade to Malwarebytes 3, which I don't recommend, but is up to you, try disabling each of those programs before attempting to install Malwarebytes Anti-Ransomware Beta. If that does not help, I'd like to request an additional set of logs for analysis. A command window will appear stating "running mb-check" followed by "running mb-grab"
HI tetonbob, and thanks for your help. I will try for sure to reinstall the AntiRamsonware while both Avast and AdvancedSystemCare are shutdown temporarily. Then I will be able to see if the installation works good. Otherwise, I will use your further links and instructions, and I will post the relative logs. I prefer to do this 2nd attempt, because I don't like the last version of Malwarebytes Antimalware, which doesn't let you to find out easily the link for updating present in main page in the previous versions. Hi Tetonbob. I tried to install Anti-Ransomware once turned off both Avast Antivirus and Advanced System Care, but the result is the same, unfortunately. So, I choosed the 2nd way suggested by you, and I attached the zip file done by MB-check. I hope that it may help to solve the problem. Hi akirod. I still believe you should upgrade to Malwarebytes 3 Premium. MBAM 2 has reached end of life, and while it continues to receive database updates for the time being, it is no longer supported. Can you explain why again you don't want to upgrade? Malwarebytes 3 has superior protection and detection capabilities. Having said that, you can try a couple of things. As you can tell, something is preventing write access to the %programdata% directory. I suspect one of your other security products still. 1. 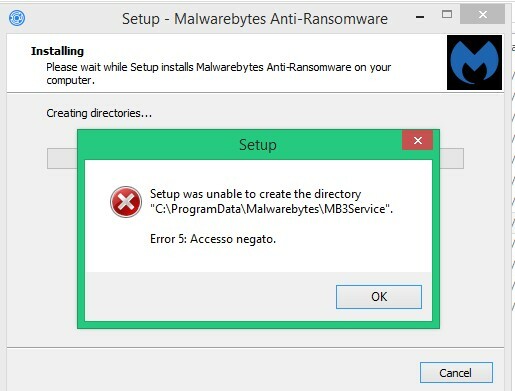 Disable Self-Protection in Malwarebytes Anti-Malware, and reboot. Try MBARW installation again. 3. Uninstall other security products and try again to install. Sometimes "disabling" a security product still leaves parts of it running. 4. Run mb-clean, do not reinstall MBAM2, and try to install MBARW. Before doing so, ensure you have your license information available.